Wrinkles can be caused due to a number of reasons, ranging from aging to genetic and hormonal disturbances to sun damage. As a person ages, the cells in the epidermis go on thinning and become less sticky. This results in the skin looking markedly thinner. The reduced stickiness of the cells allows moisture from the skin to be released rather than being retained in the skin. This results in skin dryness. Furthermore, the cells in the epidermis divide at a slower rate with age, which inhibits the natural skin repair and regeneration process. 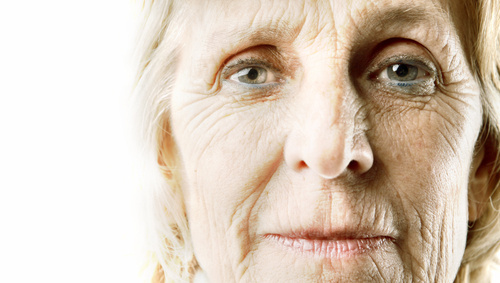 Aging also has a similar effect on the dermal layer of the skin. It makes the dermis thinner and hinders the natural production of collagen and elastin fibers. This reduces skin volume and makes the skin less elastic. All these changes in the dermal and epidermal layers of the skin result in sagging of the skin and formation of lines and wrinkles. Skin shearing takes place more easily because the ridges of the dermal-epidermal junction flatten out. Fat cells in the subcutaneous skin layer also reduce in size with age. This also causes pronounced wrinkles because the fat cells cannot replenish the depletion caused in other layers. Free radicals in the body are unstable molecules of oxygen that have only one electron instead of two. Therefore, these molecules scavenge other healthy molecules to obtain the missing electron. When the second molecule loses its electron, it goes on to scavenge another healthy molecule. This process causes damage to the genetic material and cell function, causing wrinkles in the skin. Sun damage is the most common cause of formation of free radicals. Air pollution and smoking are the other causes. Menopause and reduced production of estrogen hormone in women can cause skin changes. Scientific studies have not been able to establish a clear link between reduced estrogen and wrinkles, but several studies indicate the likelihood of this factor causing skin changes. Various experimental studies involving animals have shown that reduced estrogen can cause a reduction of collage and thinning of the skin. Both these outcomes can lead to wrinkles. Excessive use of certain muscles such as some habitual facial expressions can lead to wrinkles in a particular area because the skin loses its elasticity in that area. Crow feet originating from the corners of the eyes, and frown lines between eyebrows can occur because the tiny muscles in these areas contract permanently.